Celebrate the Presence of the East Indian arrival to Guyana as Indentured labourers on the sugar plantations of British Guiana in 1838. Slavery of Africans ended in 1834. A historic year for sugar when new labourers arrived from India. A new history in the making of Guyana and the contributions of both Muslims and Hindus will be highlighted! Today sugar workers are laid off after the recent closing of sugar factories in Guyana. Their children’s future is bleak without basic food and financial support to educate them. More sugar workers commit suicide besides the social ills of losing one’s job in Guyanese male dominated society. The funds raised will continue supporting the 250 poor students in Skeldon- through Service to Humanity- a registered NGO- towards the new school year- with free lunches every day and back to school supplies for September. Also we will be doing Qurbani in Guyana and using it to feed the children- strictly lamb. We will continue to support the poor families- like the families of the piracy attack in Berbice river during April this year leaving ten devastated families, etc. We are adding the Orphanage in Albion Berbice as an additional recipient this time. Keynote Speaker is Dr. Mohan Ragbeer, Pathologist and notable writer from Guyana who will be speaking to the theme of the contribution of the East Indians to the sugar economy of Guyana since 1838! We will be honoring two young Guyanese living in Canada as an inspiration to the youths of Guyana- MPP Sara Singh- the politician and Aftab Maxi Shamsudden- the cricketer! Entertainment includes live performances by Naaz Khan of Trinidad plus Karan Singh and Dj Slim Robin Mohamed of Guyana! Keynote Speaker is Dr. Mohan Ragbeer, Pathologist and notable writer from Guyana who will be speaking to the theme of the contribution of the East Indians to the sugar economy of Guyana since 1838! 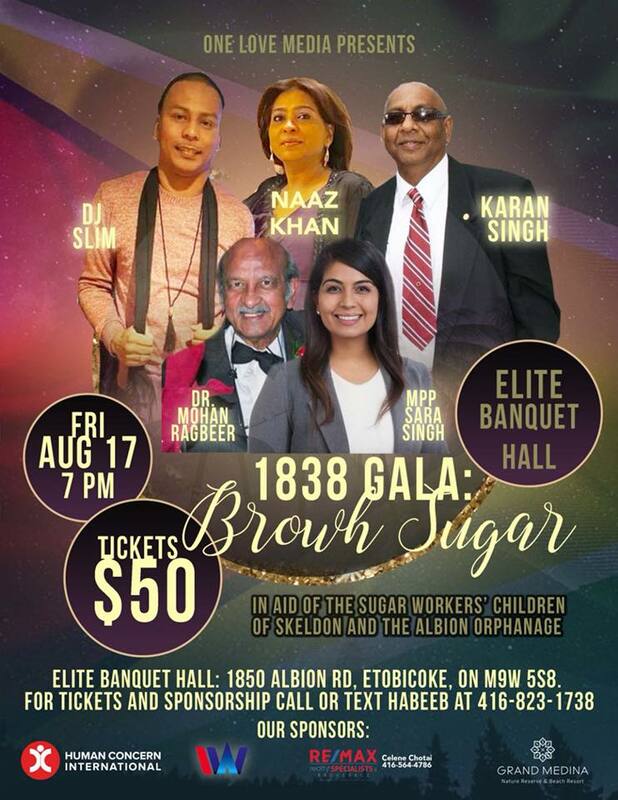 We will be honoring two young Guyanese living in Canada as an inspiration to the youths of Guyana- MPP Sara Singh- the politician and Aftab Maxi Shamsudden- the cricketer!